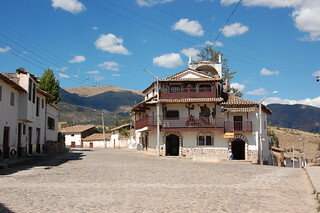 Located just 20 kilometers outside of Huamanga (the capital city of Ayacucho), the ancient city of Wari (otherwise spelled Huari, which has the same pronunciation) is the most popular day trip in the region. While combis run frequently between Huamanga and Quinua, stopping at Wari on the way, I opted to take another tour with A&R Tours. This was an excellent idea; our guide was one of the most knowledgeable I met on my entire trip, and he spoke intelligently and passionately about the troubled history of the region. 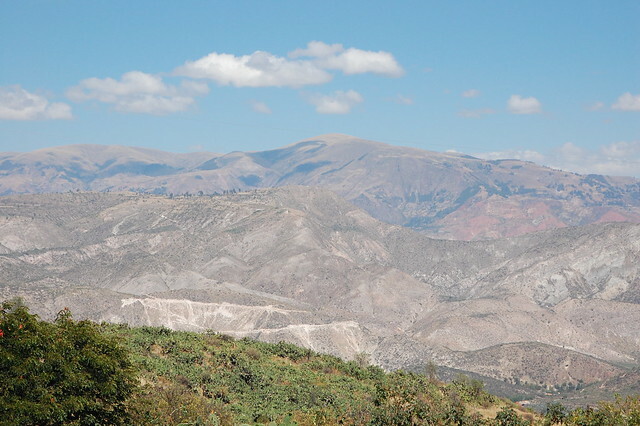 The first thing you notice as you climb into the mountains of Ayacucho is how amazingly gorgeous the scenery is. Peru’s sierra central (central Andes) is not like the high mountains I visited in nearby Chile and Argentina. 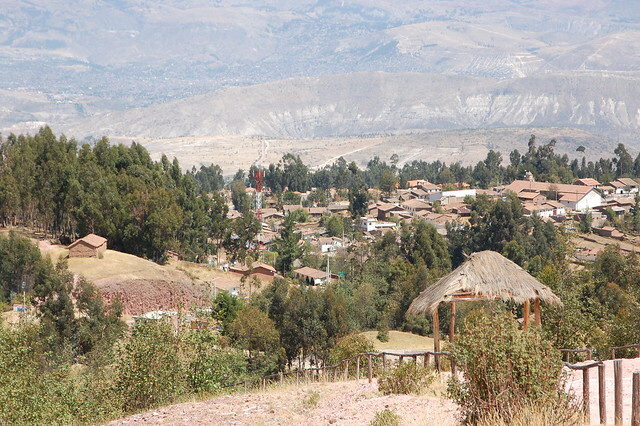 Ayacucho’s climate is different, meaning that the lower hills are dotted with green trees, cacti, low shrubs, and brown brush. I’m no plant expert, but this makes for an attractive contrast. I couldn’t stop gazing out the window of our tour van. 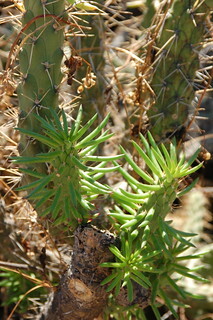 The first thing you notice about Wari are the cacti that cover the area surrounding the ruins. 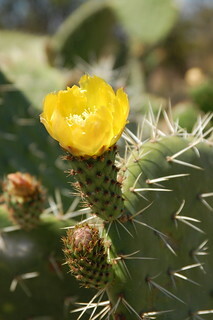 Some of the cacti are flowering, whereas others bear tuna, or prickly pear, one of my favorite fruits in Peru. 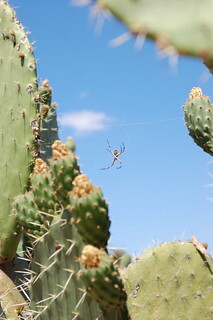 There are also tons of desert climate insects, which our group admired in fascination. 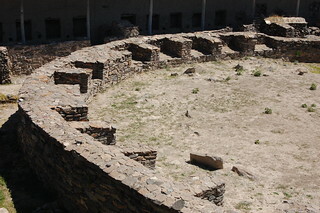 Although the ruins of Wari are extensive and expand all around the highway, most of them have not been excavated or studied. The reasons for this is two-fold: the cacti that sprung up throughout these ruins hid them from view for many years, and require great care during removal so that the ruins can be studied. 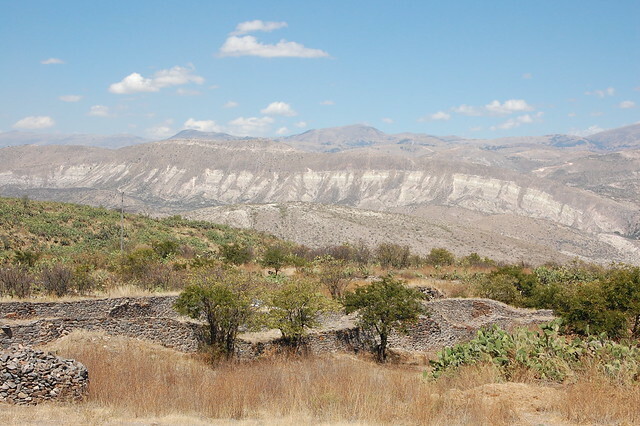 Further, during the conflict with Sendero Luminoso, studies of these ruins were completely halted. This is another cultural tragedy, because roads continue to be paved through the ruins. 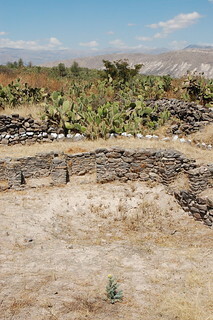 As the Wari culture is not a household name like the Incas, it is hard for archeologists and anthropologists to secure funding to excavate and study the Wari ruins. For these reasons, much of this extensive site is off-limits to visitors, but scholars continue to dig deeper (literally) to uncover the history of the practices of the Wari. Remember, the Wari’s empire once stretched up and down modern Peru’s coast as well as the sierra central. This was a powerful people who conquered many other populations, just like the Incas. When you see the stone walls coexisting with the desert plants that threaten to take the land over again, you can’t help but appreciate the diligent work of the archeologists and anthropologists who are studying and preserving these ties to Peru’s ancient history. Like many of Peru’s ancient cultures, the Wari had impressive burial rituals. 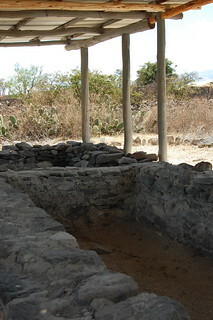 According to our guide, these small chambers were built to bury the Wari elite with their families, attendants, and possessions. 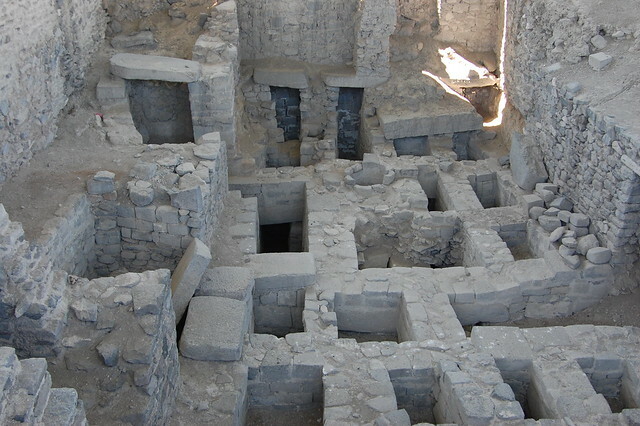 Archeologists continue to uncover new galleries located beneath each level! After appreciating the ruins still in the process of study, we saw these stone building blocks, either abandoned or moved over the past few centuries. Although the stonework is distinct from that of the Incas, it is equally impressive to imagine the work that went into carving and shaping these stones. Although much of the Wari ruins are not accessible to casual visitors, I got a clear sense of the extensiveness of the site, but most importantly, how important it is to respect and honor the Wari culture and its role in Peru’s heritage. 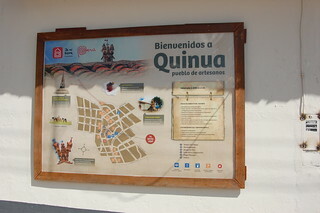 From Wari, the logical next stop is Quinua, located along the same route, just 34 kilometers from Huamanga. 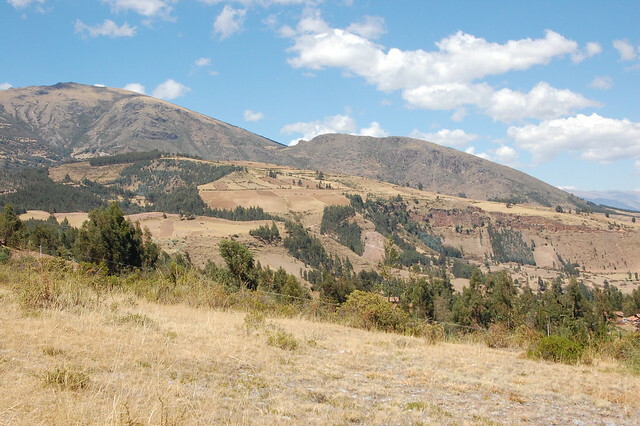 Our tour took us directly to the Pampa de Quinua (also known as the Pampa de Ayacucho). Pampa means field, and that is exactly what you see when you arrive: a large, empty field. 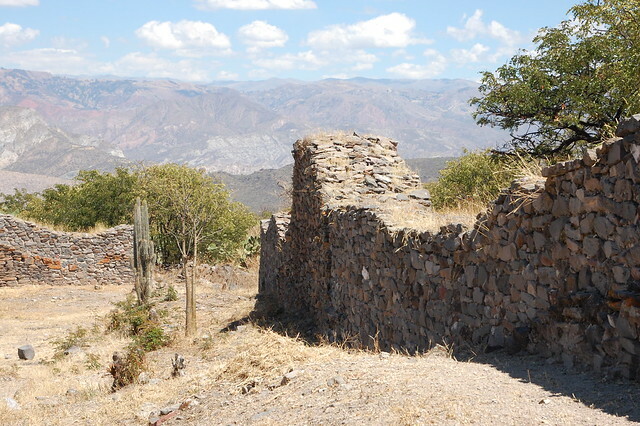 The Pampa de Quinua is the place where the decisive Battle of Ayacucho took place against Spain in 1824; this bloody encounter won Peru its independence. 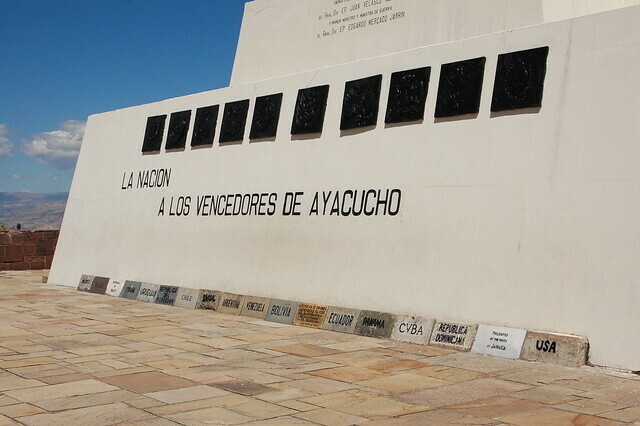 Ayacucho was named to honor the massive loss of life that occurred in this place. 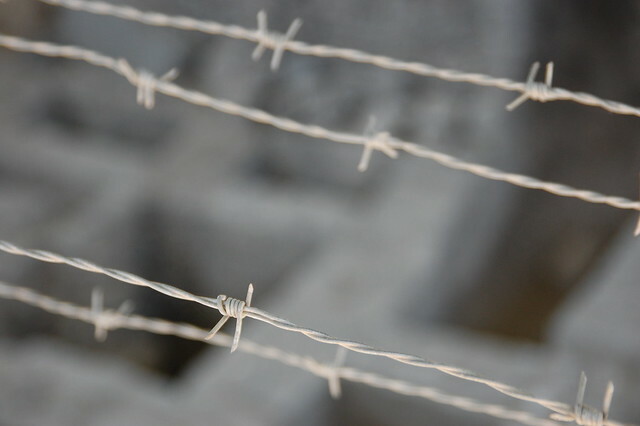 Although the landscape is picturesque, you can’t help but remember what happened in this place two centuries ago. The giant Obelisco (Obelisk) honors those who fought in the battles for Peru’s independence. At the the base of the Obelisco, there are plaques naming the nations that supported this fight, including the United States. 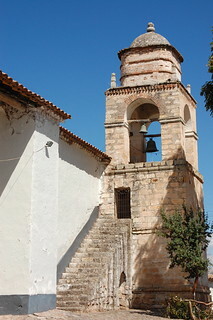 Behind the Obelisco, there is a steep path that leads down to the village of Quinua, below. The views from this area are beautiful. Quinua’s houses all have the same type of brown roof, which leads to a picture of uniformity from up above. As usual, I couldn’t resist posing and commemorating my visit to this historic place. This delicious dish is called yuyo picante. 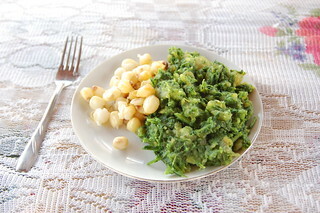 Yuyo is a local green similar to spinach, and it is cooked down with a mixture of potatoes, onions, spicy pepper, and another local herb, huacatay (known as black mint in English). This was absolutely delicious, and as I ate I chatted with the cook’s adorable son and a Spanish woman on my tour. My yuyo was served with mote, or cooked corn kernels, another favorite of mine. Of course, I had to have dessert. 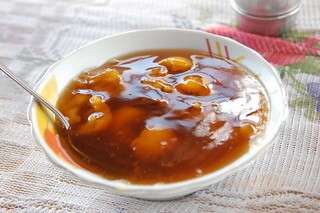 Mazamorra is a super common Peruvian dessert, basically a thick fruit pudding made with any of a number of local fruits. In Ayacucho, níspero (or loquat) is readily available, and it makes for a delicious dessert. 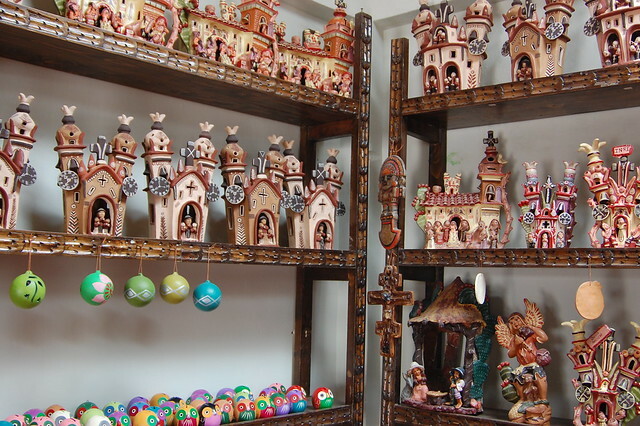 This shop shows the more conventionally colored churches, painted in a variety of tan, brown, and grey shades. 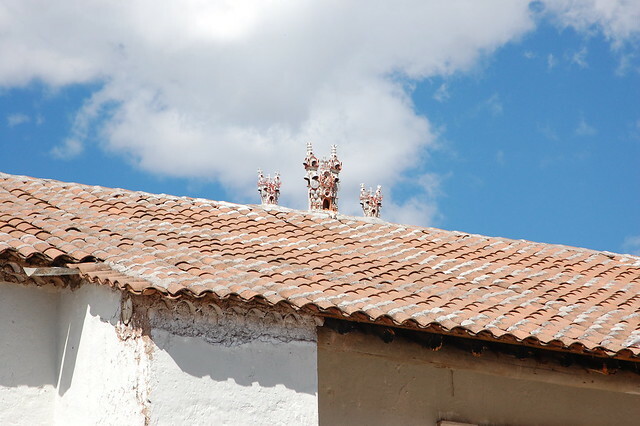 These churches are traditionally used to decorate the roof of a house to indicate that it is inhabited. According to our guide, if you do not see a church on the roof of the house, it means that the dwelling has been abandoned. 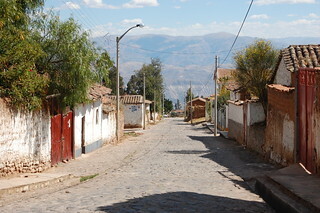 Quinua is a traditional Andean village in many ways, including its tranquil character. 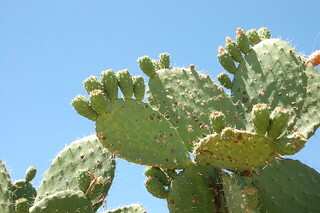 Today, it lives from its artesanía, which brings tourists in large numbers to this otherwise quiet town. 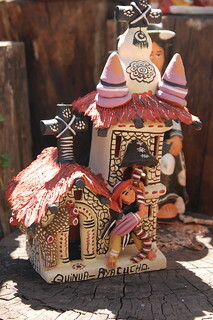 Almost everyone in town is involved in the family business of producing ceramics in large quantities. If you visit, make sure to stop in at a number of workshops, as each taller has its own style, level of quality, and unique story. Visiting Quinua is about appreciating the pleasant uniformity of a town steeped in tradition. After visiting Quinua, it was time to return to Huamanga. As we drove along the highway, I paid special attention to the roofs of the houses we passed. 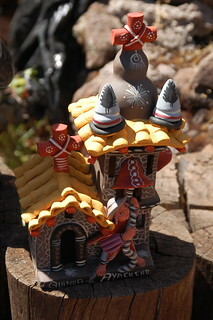 While most houses did have a church or three perched on top, there were houses that had clearly been abandoned, since they did not have this traditional decoration. 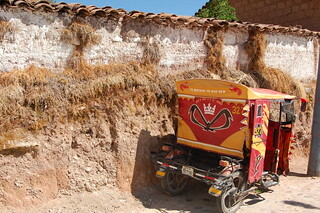 It fascinates me that this tradition is specific to the small towns in this region of Ayacucho only. The views on the road back to Huamanga were equally as impressive in the afternoon light. I tried to capture them out of the window of our tour van, as you can see here. 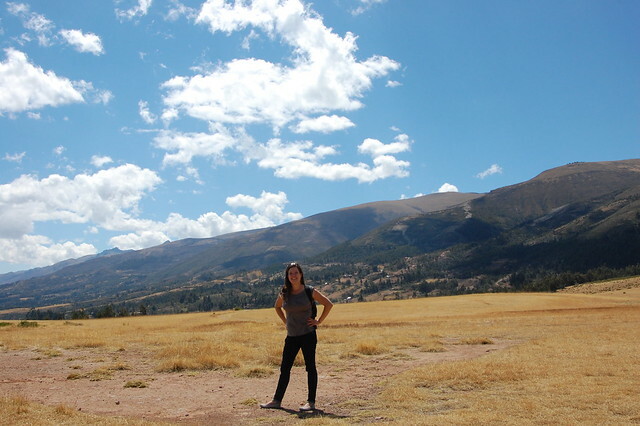 Overall, I loved this day trip to the ruins of Wari, the Pampa de Quinua, and the ceramics workshops of Quinua. Although it is easy to do this trip independently, I learned a lot from our guide and enjoyed the company of the others on my tour. However, back in Ayacucho, I also learned the limitations of depending on a tour company to get you to the destinations you’d like to visit. 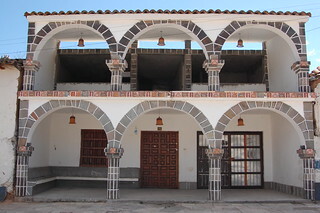 Although there were four of us hoping to visit Vilcashuamán the next day, the tour needed six passengers for the tour to leave due to transportation costs. I really wanted to visit these impressive Incan ruins, so I went back to my friends at iPeru and they convinced me that it was indeed possible and completely safe to visit on my own. This little push set off a series of adventures off the beaten track on public transportation that I will document in future posts! You should absolutely visit Wari and Quinua for their historical and cultural significance. If you’d like to take a tour (in Spanish), I highly recommend A&R Tours, which cost S/.35 in August 2013. All of my explanations above come from what our guide told us, so the tour was thoroughly educational. 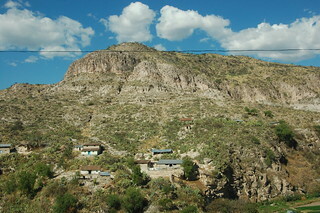 Otherwise, there are frequent combis (van buses) that run between Huamanga (Ayacucho) and Quinua. 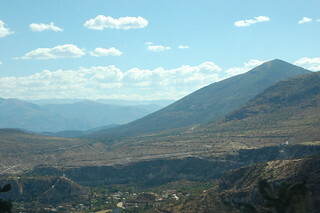 The combis leave from Paradero Magdalena near Avenida Cáceres. You can ask the driver to be let off at the ruins of Wari. iPeru recommended visiting Wari early in the day to ensure you could catch another bus to Quinua and then back to Huamanga. As with many local buses in Peru, you just need to flag down the combi as it passes by. This is how all the people in the small villages along the highway get around, and the buses can get packed. 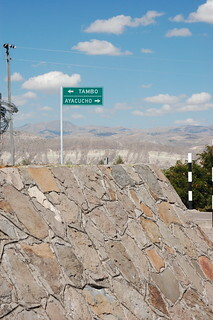 All the locals call the city of Ayacucho Huamanga, as I’ve already mentioned. Apparently, it is much harder to catch a combi after 5PM, so I suggest going earlier. The bus between Huamanga and Quinua costs S/.3.50-4, and between Wari and Quinua it should be about S./1-2. 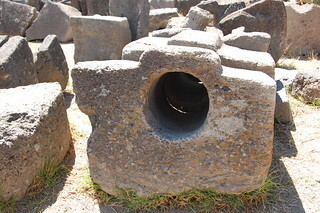 Entry to the Wari complex costs S/.5, but may be included in your tour, as it was for me. 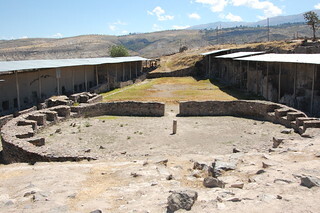 The ruins are open from 8AM-6PM, but verify with iPeru before visiting. 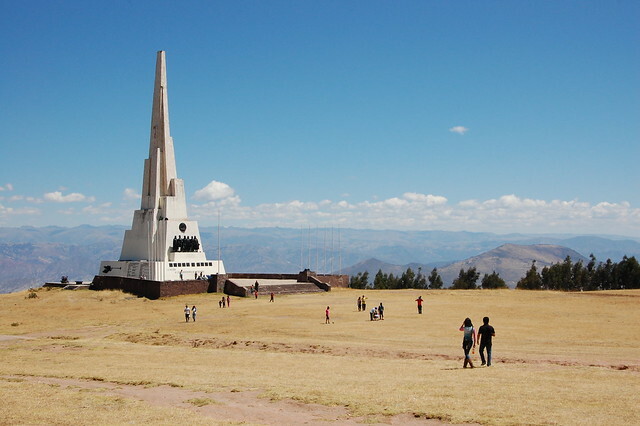 If you do take the bus to Quinua, make sure you climb up to the Pampa de la Quinua to visit the Obelisco and visit this significant site in Peru’s history. I highly suggest eating lunch from one of the many stands and supporting the women of Quinua who cook these inexpensive, nourishing meals and haul them up the hill from the village below. 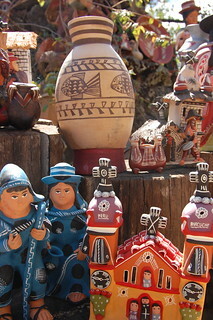 Don’t forget to visit the ceramics workshops (talleres) in Quinua, as the people of Quinua are well-known for their skill. 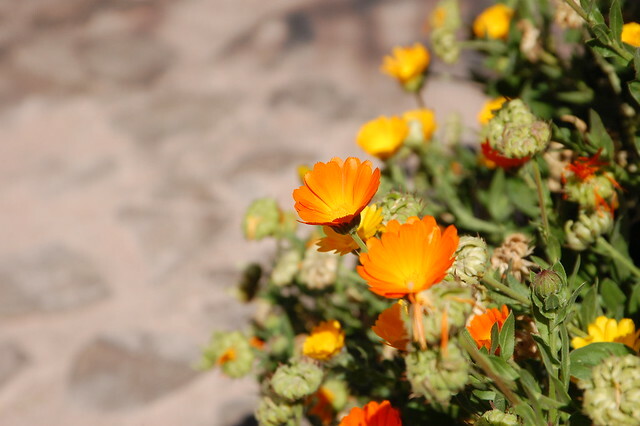 If you read Spanish, read this blog post about Wari and this one about Quinua.